In the aftermath of a successful referendum process in South Sudan which will likely lead to the emergence of two new states – North and South Sudan – from one, and against the backdrop of sweeping changes throughout the Middle East and North Africa, violence in Darfur appears to be on the rise. In this context, the vigorous diplomacy of the Obama Administration, which made a significant contribution to preventing conflict leading up to the referendum itself, needs to be extended. 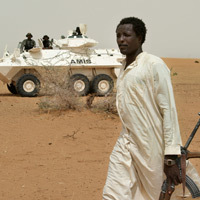 While key issues related to consolidating peace between North and South remain unresolved, and continued U.S. and international attention on these and related matters remains an imperative, Darfur must become a focus of U.S. and broader international policy equal to that of the North-South dynamic. As the implementation of the Comprehensive Peace Agreement, or CPA, moves forward and the United States begins the process of reviewing Sudan’s State Sponsor of Terrorism designation accordingly, it is important to reemphasize that the overall process of normalization of relations, including the full lifting of U.S. sanctions, is dependent upon verifiable improvements of conditions on the ground in Darfur. Given recent reports of escalating violence, including aerial bombardment of civilians, the challenges to achieving progress in Darfur remain urgent. With the current Darfur peace process in Doha proceeding towards conclusion, it is time to reassess and rebuild a more robust, comprehensive and coordinated Darfur peace process. The revised approach should be one that is truly cooperative and eliminates the tensions between the envoys that has itself become an obstacle to peace. With senior level attention as we saw in advance of the referendum, the United States could lead in re-conceptualizing and guiding the Darfur peace process, and ultimately in contributing to securing a more peaceful environment for the people of Sudan. Frustration with Doha, which threatens to result in an even worse outcome than the failed 2006 Darfur Peace Agreement, signed in Abuja, clearly necessitates a radical reexamination of the overall peace strategy for Darfur. The shortcomings of Doha and Abuja, however, will only be worsened by acceding to the Sudanese government’s plan for full nationalization or “domestication” of the peace process prior to fundamental changes on the ground, and will not be solved solely by cosmetic changes to the venue and mediation. Recent escalating attacks on civilians by the Sudanese Armed Forces and rebel groups, ongoing restrictions on humanitarian and peacekeeper access, and the detention and repression of human rights activists and political protestors make Sudan an impossible venue for such critical negotiations. There already exists a model of successful peacemaking in Sudan: the process that led to the CPA in 2005. In that case, there was one single, empowered mediator supported by the key multilateral institutions and countries with influence. The process took place in a nearby country that allowed freedom of movement for the various participants, without interference from Khartoum. The mediation was extremely proactive in presenting compromise positions and moving forward with a single text that addressed the fundamental issues causing war between the North and South. Leverage was built and utilized by governments that backed the process and united in support of a just outcome. A similar process must be created from the ashes of the existing efforts, making improvements based on lessons learned. High-level political negotiations outside of Sudan between the various parties to the conflict, including the government of Sudan, the Justice and Equality Movement, the Sudan Liberation Army – Abdel Wahid, the Sudan Liberation Army – Minni Minawi, and the Liberty and Justice Movement. High-level coordinated diplomatic engagement to push for democratic transition in North Sudan in support of human and civil rights in the region. It is essential that the international community work to ensure that the secession of southern Sudan does not lead to a further decline of rights and political space in the North, but rather offers an opportunity for increased transparency and pluralism. Although democratic transformation is in no way a prerequisite for peace in Darfur, it is crucial that the Darfur peace process be incorporated into the broader context of the future of the North. Just as each of the above components is necessary to secure a sustainable peace, none of them will suffice on their own. A political process outside Sudan is critical to getting the rebels to the table, but cannot succeed without meaningful civil society engagement, both inside and outside Darfur. Any peace deal achieved can only be maintained and consolidated if it is firmly grounded in the future of all of North Sudan, while recognizing that Darfur still requires unique international attention.